This is now easier to use on a mobile device, and provides a map option on the desktop version. This should make it easier to find NYC meetings. 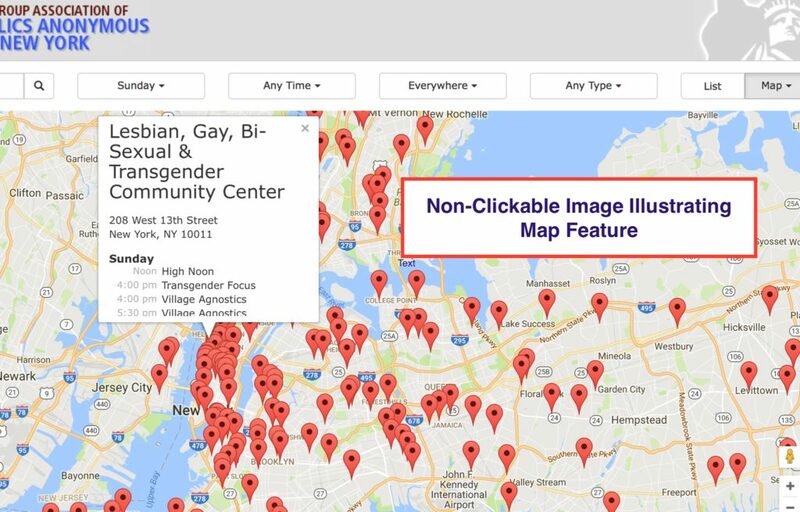 This screen capture shows how easy it is to find NYC meetings near your current or planned location using the map feature. This entry was posted in AA, community, success and tagged beginners, bill wilson, gay and lesbian, how it works, meetings, tips, treatment on October 2, 2016 by tom buzz. This entry was posted in AA, community, living sober, stories, success, tips and tagged beginners, how it works, meetings, tips, treatment on August 29, 2016 by tom buzz. Quotidian Buzz welcomes the first member! This entry was posted in community and tagged beginners, justice, Louise Hay on July 27, 2010 by buzzer. This article had a weird slant; it seemed to imply that all alcoholics in recovery are just seconds away from relapse at any time. Perhaps it was just NYT trying to create drama. Good article, though. This entry was posted in community, play and tagged Fire Island, gay and lesbian, GLBT, Montauk, summer on July 24, 2010 by buzzer. Does Everyone Need AA to Get Sober?